Какво по-добро начало за една Нова година и по-голяма надежда? Poets are the messengers of the future! They have been the richest source of inspiration since time immemorial and their role is evident from all the minor and major revolutions that the world has ever witnessed. Somewhere on the way to today, we have lost a finer attitude for our beautiful Planet Earth and though scientists and enthusiasts, at least from some parts of the world, are trying to bring a change, it is poets who can truly bring a revolutionary change in the world. Here is a compendium of exceptional poems from poets across the globe that would assert the same on Global Harmony and Peace. 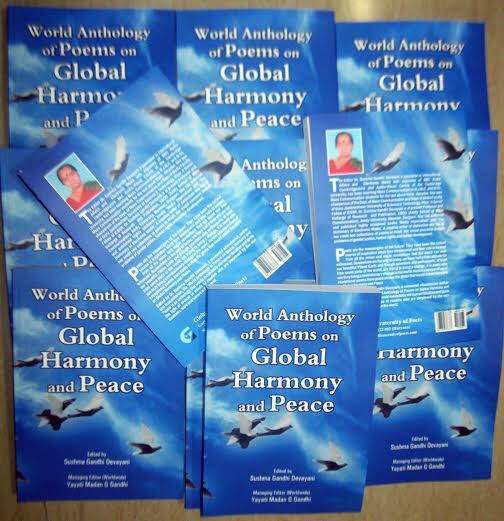 Edited by Dr. Sushma Gandhi Devayani, a renowned educationist, author and humanitarian, the ‘World Anthology of Poems on Global Harmony and Peace’ is an anthology that would indubitably stir human faculties and ignite the light of reason in minds of readers who are perplexed by the eco-disasters, wars and terrors in the world. The Editor Dr. Sushma Gandhi Devayani a specialist in International Affairs and Electronic Media with exposure of BBC Radio Cambridgeshire and Audio-Visual Centre of the Cambridge University, has been teaching Mass Communication to B.J.M.C. and M.Sc. Mass Communication students for the last about three decades. She was chairperson of the Dept. of Mass Communication and Dean of Media Faculty of Guru Jambheshwar University of Science & Technology, Hisar. A Senior Fellow of ICSSR, Dr. Sushma Gandhi Devayani is at present Professor and Incharge of Research and Publication, ASCO (Amity School of Mass Communication), Amity University, Manesar, Gurgaon. She has authored and published highly acclaimed books ‘Media Imperialism’ and ‘The Dictionary of Electronic Media’. A creative writer of distinction she has to her credit two collections of poems in Hindi. Her social concerns include problems of gender justice, human rights and human development.